There is an expectant air as we take our seats tonight, for this is a rare opportunity to witness some extraordinary dance premieres in an intimate non-London venue. The great Robert Cohan, at 93, is in the audience, as are 2 dancers from the original Kenneth Macmillan piece Playground, a re-imagining of which, is being shown tonight. With choreographers, Sophia Stoller and Yolande Yorke-Edgell (Artistic Director), also present – with Yorke dancing in her own creation, Imprint – we know we are going to get close to these pieces; close to their creators. The evening opens with Between and Within by emerging Los Angeles choreographer, Sophia Stoller. Set to the commissioned music by Justin Scheid, the 2 couples bend, pulse and undulate; sometimes in coiled-tight tension, the space between their bodies dense with pressure. At other times, the dancers release and flow into free-fall – a constant push-pull energy of encounters, conflict and empathy. The haunting and discordant string music vibrates in perfect disharmony with this uncluttered, honest performance. Bare and imposing, Between and Within more than whets our appetites for a feast of excellent dance. In stark contrast to Stoller’s stripped back piece of form and sinew, comes a restaging of Playground, a disturbing work by the late Kenneth MacMillan. First seen in 1979 at the Edinburgh Festival, Playground has been resurrected and re-imagined with the help of Grant Coyle’s notation and coaching by 2 original cast members, Susie Crow and Stephen Wicks. Playground is an intense melting pot of sinister childhood factions and mind games, set against an institutional, wire-fenced backdrop. Awkward-limbed adolescents, hormonal bodies and musical jangles, blend and clash in this piece of menacing dance-theatre. Adults playing children – who are sometimes playing at being adult – embroiled in dark, messy interpersonal relationships, is both intriguing and challenging. However, this version of Playground somehow lacks substance and truth. Rather than becoming immersed in its theatrical mayhem, I find I am distracted particularly by the 2-dimensional, doll-like female roles. And because this is a restaging of an original work, I am left wondering if it is the piece itself, or its re-imagining that leaves me feeling dissatisfied. Next – and my personal highlight of this evening – is Communion by Robert Cohan. The dancers are positioned in a line, their backs to the audience. Dimly-lit from above, they turn slowly and walk – moving towards us, as one. Advancing and retreating as a congregation, the rhythm alters, as one dancer – then two, then three – are left behind, only to be retrieved at the next pulse. Dancers kneel, directing their holy gaze upwards in adoration. They pray, bow their heads in humility and re-join the sacred walking mass. Then, their meditative flow is punctuated with more surging movements, like gasps of breath, as the audience hold theirs. For this is a reverent affair and we are still; in awe. As the piece gains momentum, the dancers sit on chairs lining the sides of the stage, gazing at those opposite. With their energy focussing inwards, we too, are transfixed, as the male soloists take their place centre-stage, in what feels like a spiritual space. Dane Hurst is stunningly beautiful in his liquid movement and Jonathan Goddard – as ever – does not disappoint with his individual muscular fluidity and ever-present charisma. But Communion celebrates the human collective. Each dancer – a single cell in a bodily mass – understanding both its individuality and unifying role. A vibrating life force, breathing and moving en masse, yet every dancer visible and unique. Both graceful and athletic, soothing and piquant, Communion has a divine quality which stills the audience and quickens the heart. Above all, Communion makes you feel. A fitting end to an evening celebrating 20 years of The Yorke Project, is Yolande Yorke-Edgell’s personal work, Imprint. 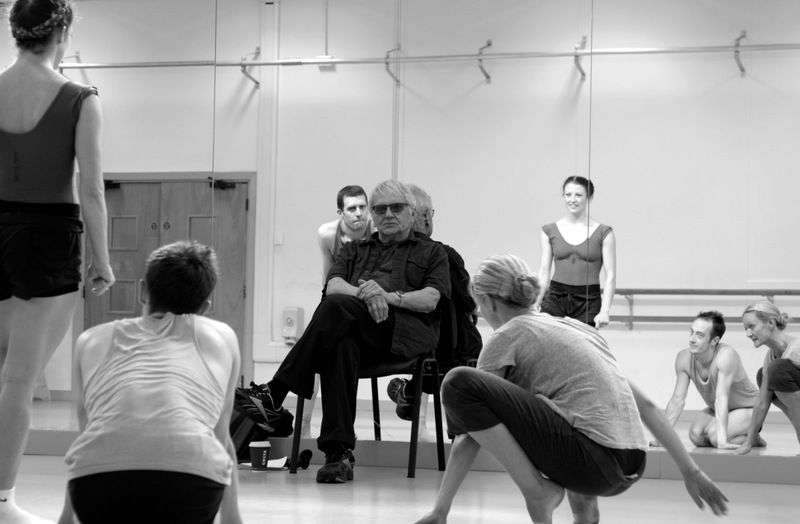 Yorke intersperses dance with her own voice and that of admired choreographers who have influenced her work. The opening piece is set to punchy, rhythmic French narrative, as the 3 dancers spring, coil and furl, like punctuation on a page. Freya Jeffs confidently claims her place in the work with her solo. In a skin-tight red dress (a flash of colour within an otherwise muted costume palette), she is composed, elegant and strong. The jaunty finale, with Yorke and her dancers smiling incandescent, buoyed up by a rapturous audience, is a joyful celebratory end to the evening. Nonetheless, as the choreography-packed evening comes to a close on this effervescent high, I wonder if I am the only audience member still quietly basking in the after-glow of Robert Cohan’s Communion. Birmingham Royal Ballet’s Romeo and Juliet in photos!